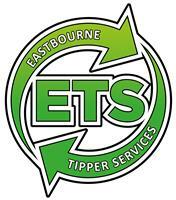 Eastbourne Tipper Services Ltd - Rubbish/Waste/Clearance based in Eastbourne, East Sussex. Eastbourne Tipper Services Ltd offer cost-effective waste and rubbish clearance services to customers throughout Eastbourne and the surrounding areas. We pride ourselves on our friendly, professional approach and aim to please every single customer we work for. So whether it's a single item or a full house clearance, ETS can help! We can clear and legally dispose of almost anything. From household rubbish, furniture and electricals; to garden waste, builders waste, soil and wood. We are fully licenced with the Environment Agency and have public liability insurance through Zenith. Everything we collect is taken to a commercial waste transfer station that recycle around 95% of all the rubbish they receive. The remaining 5% is incinerated to help produce electricity, which reduces the use of fossil fuels and means nothing goes to landfill! The means that with ETS, your waste will not be wasted! Please get in touch for a quick, free, no-obligation quote.